I love Greek food! 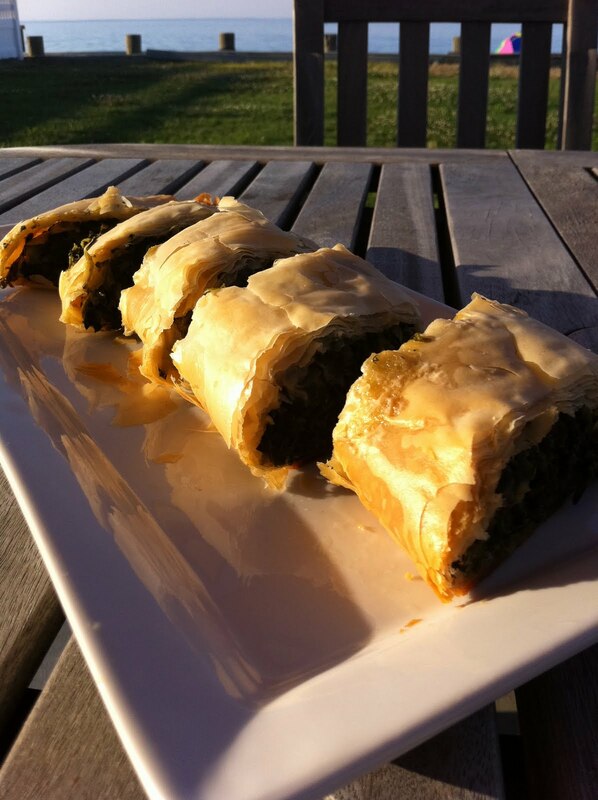 My favorite is spinach pie (Spanakopita). We used to go to John’s Coffee Shop in Cedarhurst and devour them at least twice a week. This is my version…it is always a big hit at parties. I really think it is perfect! My spinach pies have been known to take different forms: one large pie (like the photo below), little individual pies, or as one big roll or two smaller ones (like the photo above) using the same measurements. You can make the filling 2 to 3 days ahead of time and keep in an air tight container in the refrigerator. Bring it up to room temperature when ready to make your pie. * Phyllo dough usually comes frozen. Check the package for instructions on how to thaw and then organize your pie making accordingly. Phyllo dough is tricky to use so pull the you will be using out of the box and then cover with a towel while working to get the pie together. I like to lay the sheets right onto the baking sheet and then when it is rolled it is already on there. Cook the spinach according to the directions and then drain and cool. Press as much water out as possible. Set aside. Water or oil sauté the onion until translucent. Add in the leeks and scallions, season with salt, and continue to sauté until translucent. Add in the chopped artichoke hearts, dill and spinach. Mix together really well. Taste and adjust dill and salt. Add a tablespoon or two of fresh lemon juice if you want to brighten the flavor. Preheat oven to 375. Roll out the phyllo dough. Be sure to cover it while you are working. It dries out fast. For one large pie, brush a deep baking dish with olive oil and lay at least 6 sheets of phyllo in the bottom, brushing each with olive oil. Pour the mixture in and spread it around. Top with at least 6 sheets of phyllo but don’t brush them individually with oil (I think this makes it more flaky), just brush the top one. Pre-slice into individual squares and slice a little air vent too. 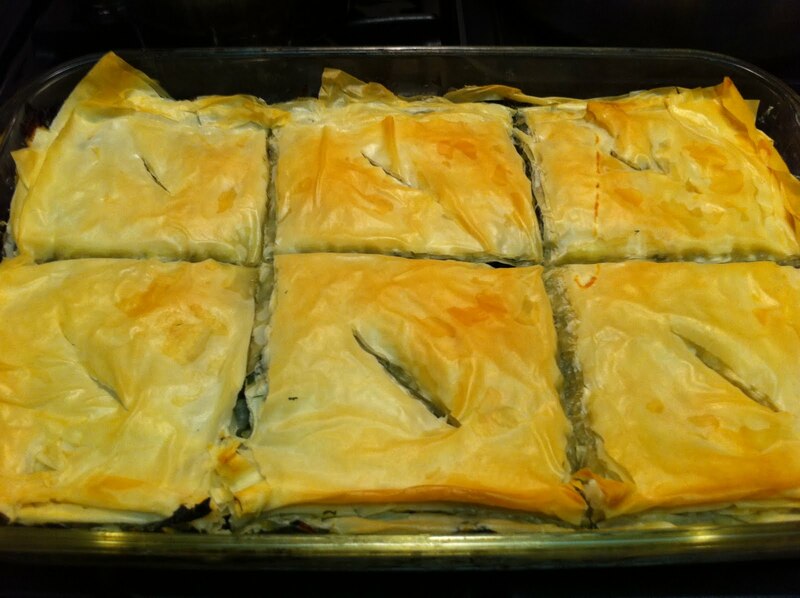 For individual pies, use three sheets of phyllo dough, depending on the width of the dough, cut it in half. Brush the top piece with olive oil and add about a softball size of the mixture. Fold into a triangle and keep going until it is all folded. Brush with olive oil and slice air vents into the top. These measurements make anywhere from 8 to 12 pies depending on the size of the dough.Place on a lined baking sheet and bake. For the logs, use 6 sheets of dough for each roll. Brush each sheet with oil and lay one on top of the other. Then, lay about half of the mixture across the end closest to you. Pick up that end of the dough and roll over itself, stopping to tuck in the ends about halfway, until it is all the way rolled. Brush the top with oil and slice air vents into the top at an angle, the size of the pieces you want. Place on a lined baking sheet and bake. Whatever shape you make, bake for at least 30 minutes or until the top is nice and crispy. Take out of the oven and let it cool off so it is easy to handle. Cut and serve!